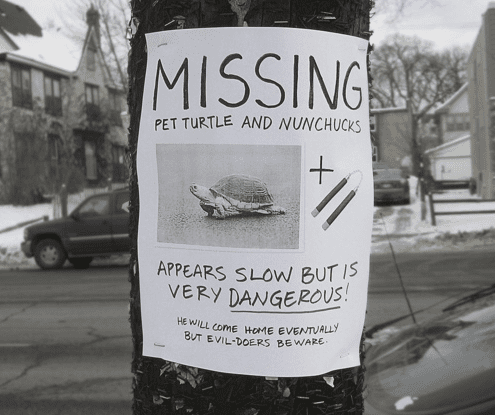 These Hilarious Street Posters Will Have You Crying With Laughter! These days, street posters can serve many purposes. They can help track down lost pets, advertise upcoming local events, or remind neighbors to clean up after themselves. 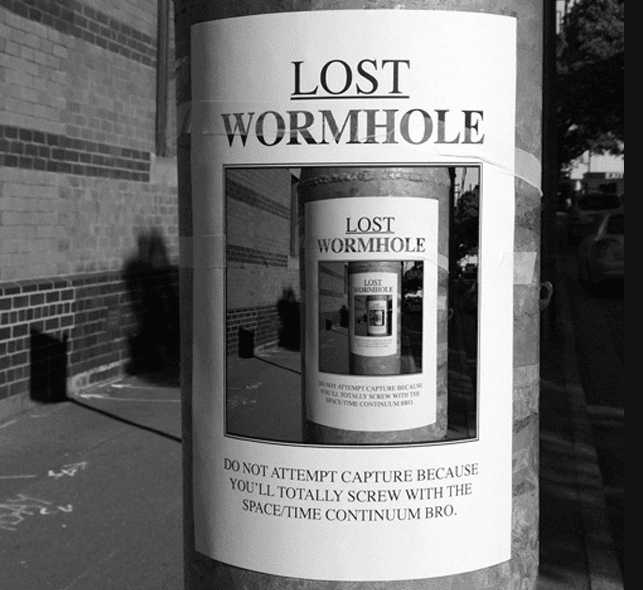 Sometimes, however, street posters are simply hilarious. 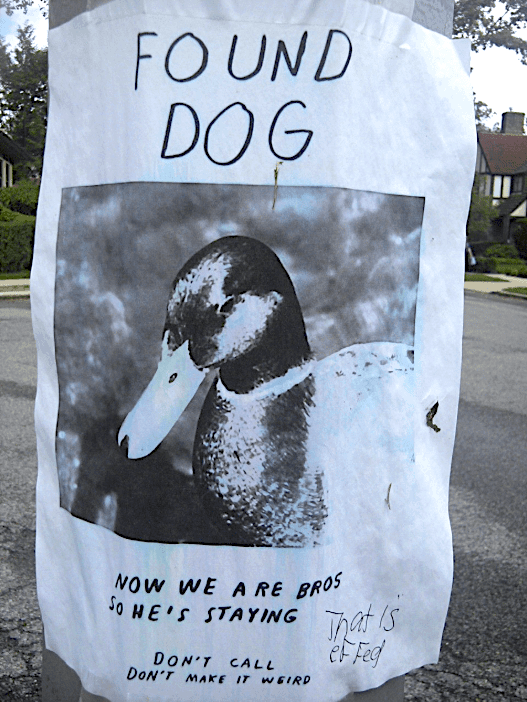 Join us as we explore the funniest street posters out there. Who could turn down an offer like this? 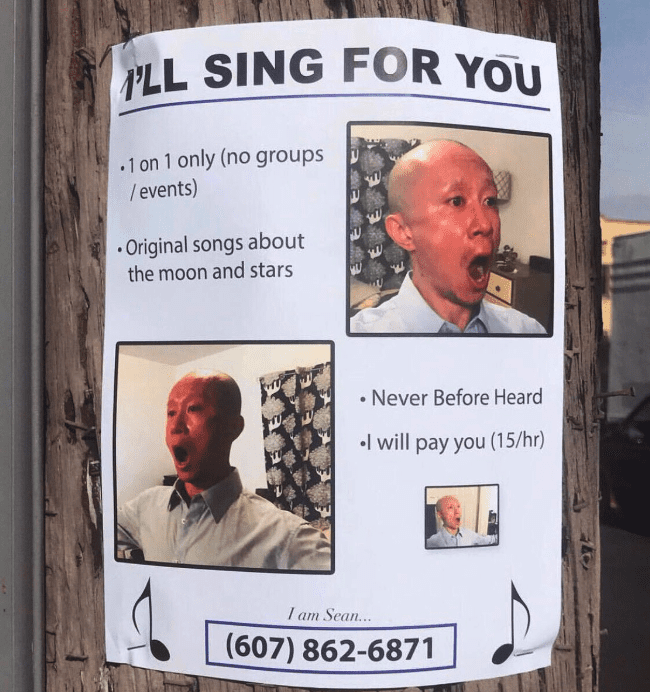 Not only will Sean provide you with a 1-on-1 concert where he’ll sing never-before-heard original songs about the moon and stars, but he’ll also pay you $15 per hour! Sign us up! If you’ve been searching for some family-friendly entertainment for your kid’s upcoming birthday party, look no further. This gentleman has got you covered. 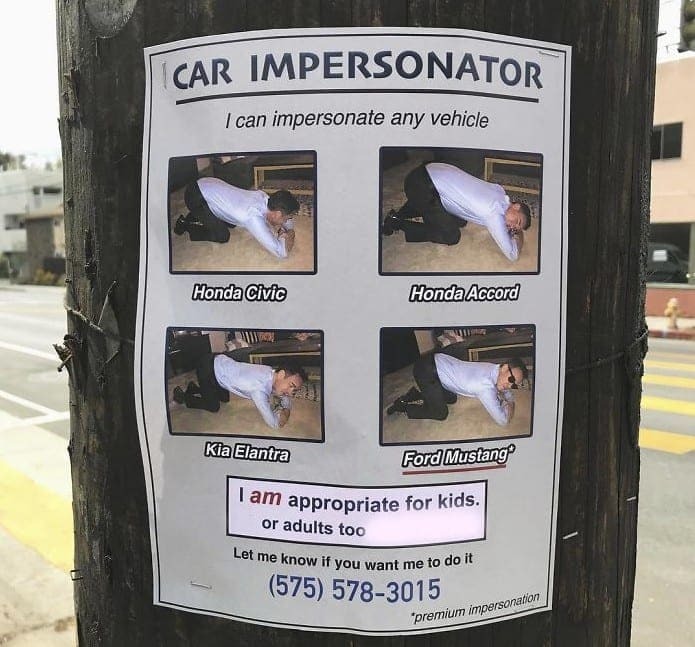 He is now offering his unique and affordable services as a professional car impersonator. You won’t be disappointed with his incredible impersonations of cars like the Honda Civic, Honda Accord, Kia Elantra, and even the Ford Mustang (if you’re willing pay the “premium impersonation” fee, that is). Parents will be happy to discover that his car impersonations are fun for all ages! 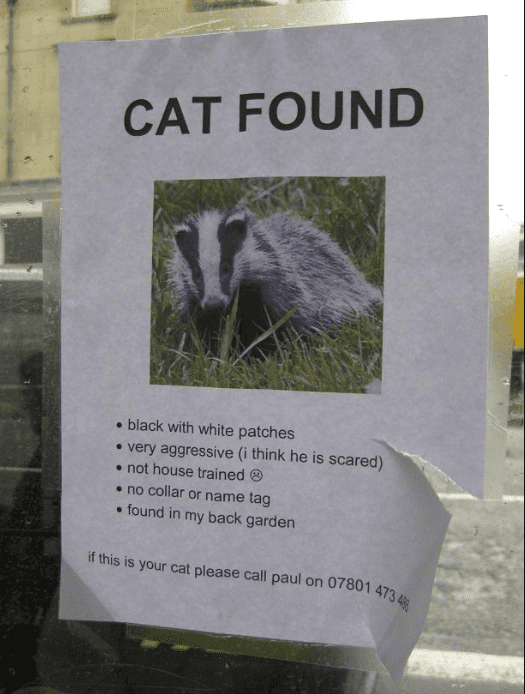 Something tells us that whoever put this poster up didn’t find a cat. To be completely honest, we have no clue why they would even photograph this creature in the first place. 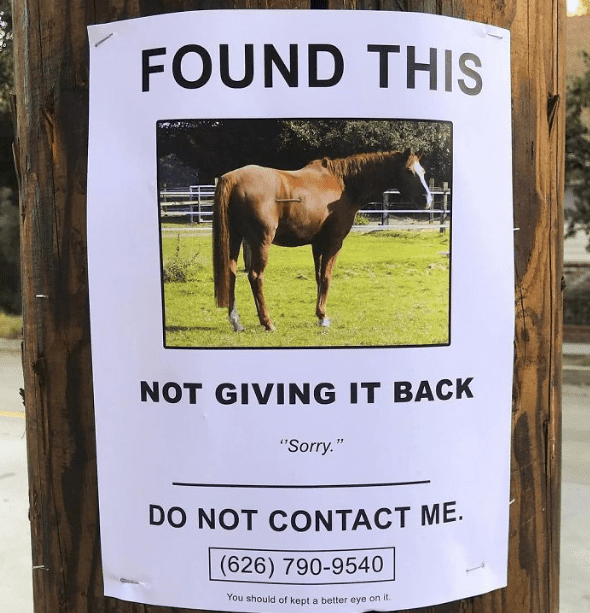 As it says in the poster, the “cat” had “no collar, was “very aggressive,” and was “not housebroken.” As much as we hate to be the bearer of bad news, we feel an obligation to share with whoever made this poster that this was no cat. It was something else. This man can chop just about anything. With his innovative and progressive techniques, he can chop materials such as wood, tires, and even strong wood, among others. 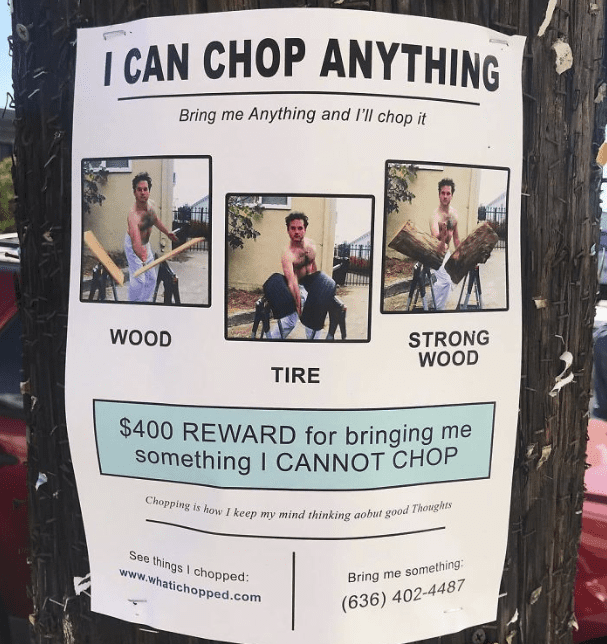 He’s so confident in his chopping abilities that he has even offered a reward of 400 dollars for the person who can bring him something he can’t chop. Just in case meditation isn’t doing the trick for you, this wood-chopper claims that chopping helps him to keep his mind thinking about good thoughts. Some people care about animals a lot. This is a good thing. Other people care about animals too much. This poster is an example of caring about animals too much. While it’s nice to care for a bird you see on the street, it’s important to understand that a pigeon usually just wants to be left alone. 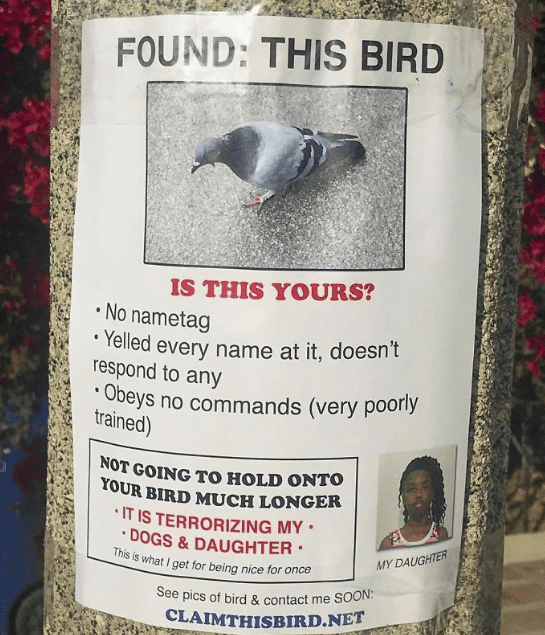 The reason why it won’t answer when you yell names at it is the same reason why it won’t obey any commands – because it’s a pigeon. 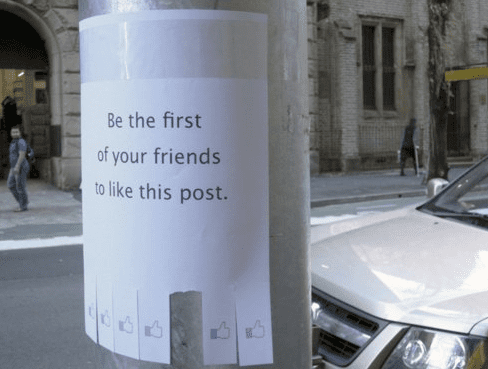 This clever poster-maker decided to troll the world of social media marketing strategies and Facebook likes by creating this hilarious street poster. Unfortunately, someone has already claimed the first “like,” so you’ll no longer be able to have the honor of being “the first one to like this post.” Regardless, you can still claim one of the remaining likes and keep the thumbs up emoticon in your back pocket. You never know when it might come in handy. The neighborhood hot tub hooligan is at it again! 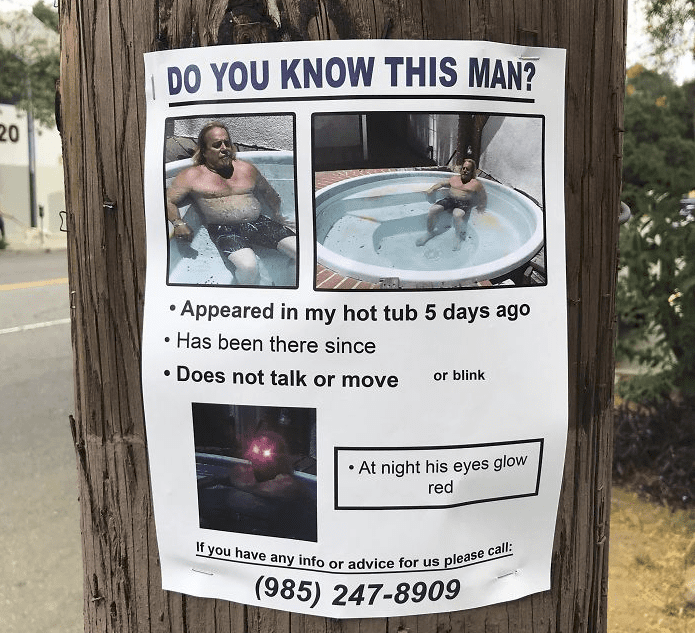 This mysterious man comes out of hiding once every six years, only to sit without moving or blinking in the neighborhood hot tubs. There are various myths and rumors about his existence. One theory claims that he gets special powers from the hot tubs. Another theory claims that he just likes sitting in hot water. In either case, we’re just glad that someone in the neighborhood is doing something about it. With everything that’s been going on in the news lately, it really warms the heart to see a good deed. 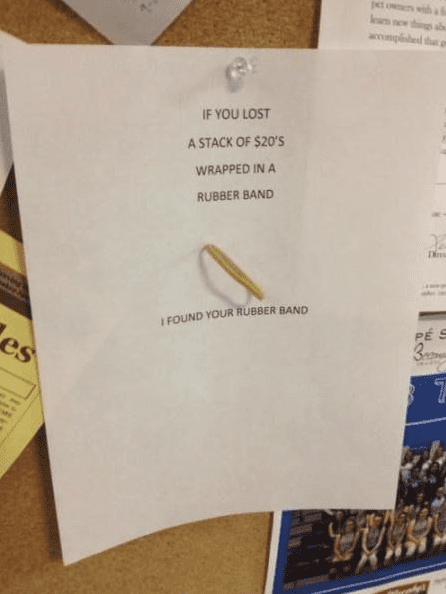 Here we see a poster that an anonymous good Samaritan put up, explaining that they found a rubber band holding together a stack of 20 dollar bills. While they easily could have kept the rubber band for themselves, they decided to do the right thing and give it back. 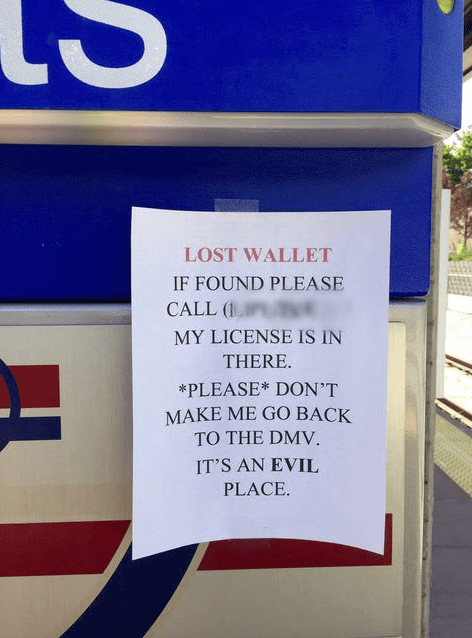 Hats off to this good samaritan for their good deed. 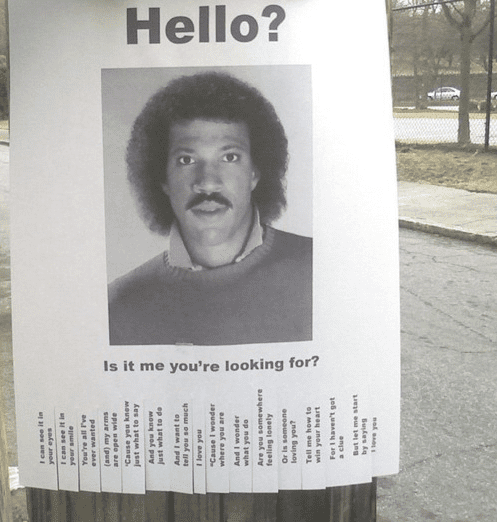 Apparently, there is a Lionel Richie fan out there with way too much time on his hands. He simply can’t resist the urge to share the beautiful words of the 1980s R&B singing sensation with the rest of the world (or at least his neighborhood). He even went so far as to print out and cut up little pieces of paper with the lyrics to “Hello” on them. Now the whole neighborhood will be able to sing along! You love to see a neighborhood where people look out for one another and do their best to ensure that their neighbors are having a good day. In this neighborhood, one gentleman puts up posters every Thursday morning which help his neighbors have the best possible day. 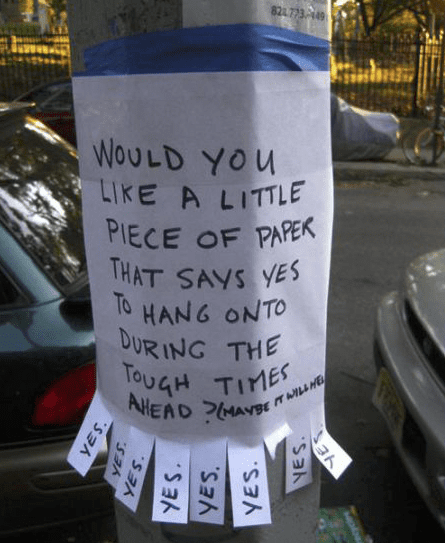 Last week, he put up this poster, which offers free small pieces of paper with the word “yes” on them to anyone who walks by. Think of it like a very unclear fortune cookie. 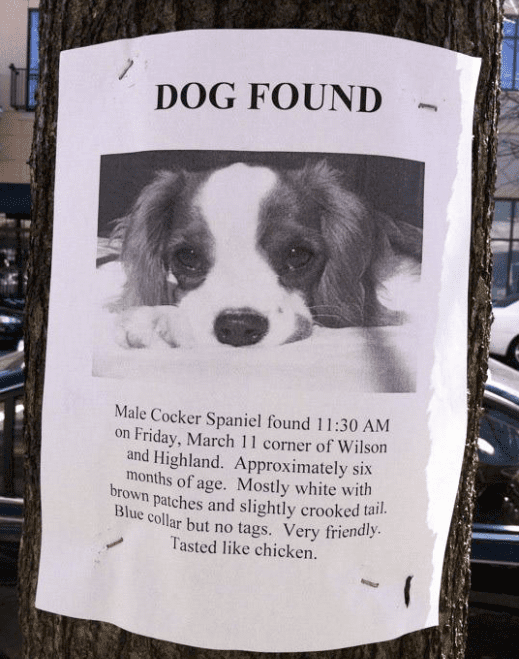 We’re not sure who to feel sorrier for- Toby (the dog in the photo) or the man who made this poster. 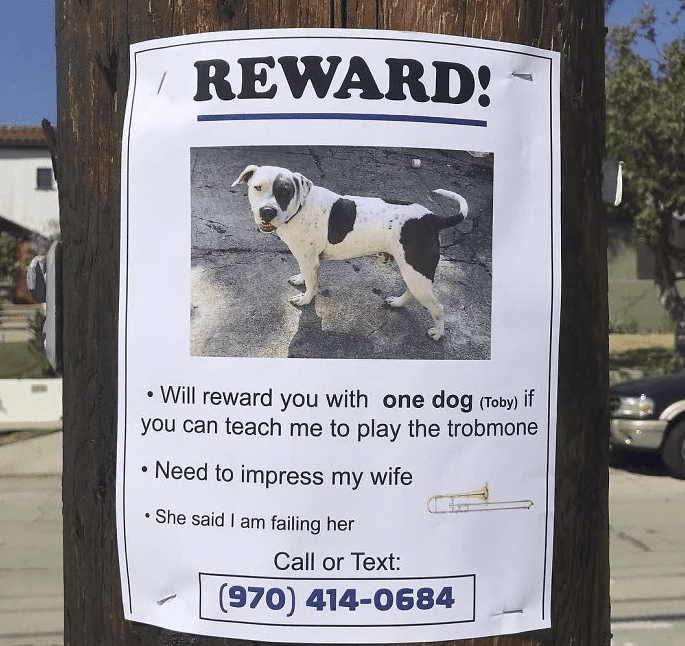 Apparently, the gentleman who put up this poster believes that he’ll be able to save his marriage by learning how to play the “trobmone,” and impressing his wife, who says that he is failing her. Maybe what he really needs is a quick lesson in spelling, and maybe even one in how to be a responsible pet owner. We can’t help but feel bad for this poor cat owner. 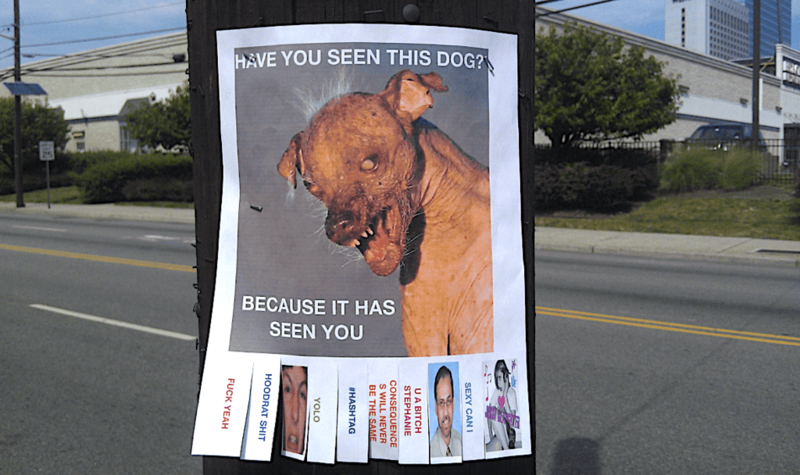 His cat ran way last night, so he decided to hang posters all over the neighborhood advertising his lost pet. 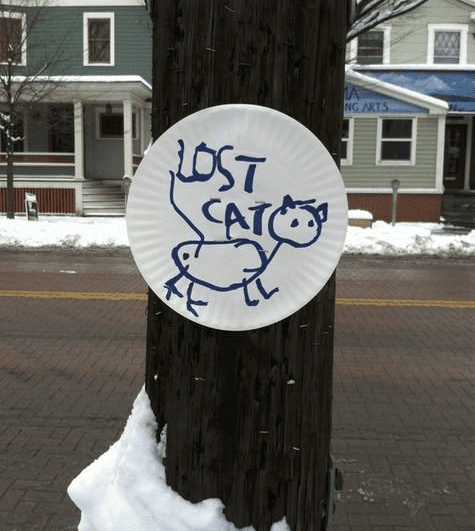 Unfortunately, he ran out of poster paper so he needed to draw pictures of his cat on paper plates. 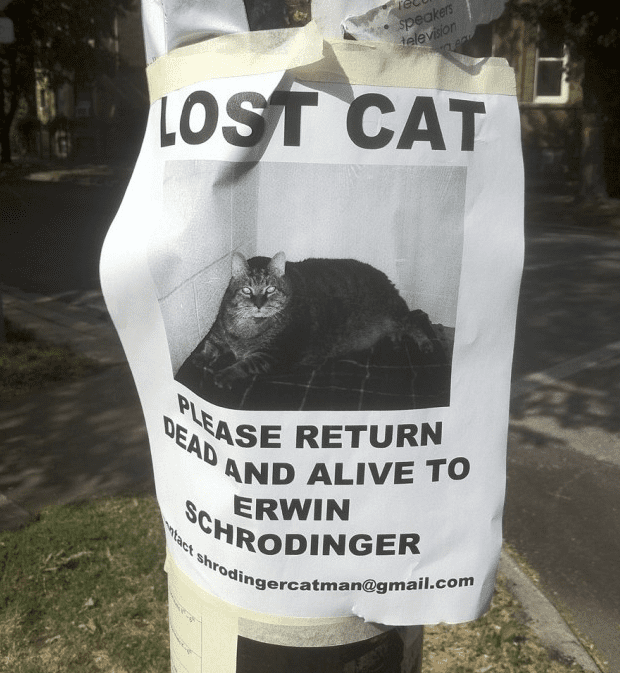 While we’re truly hoping that this man will reunite with his feline friend, we’re not so sure these posters are helping his cause. Maybe he should’ve taken the time to get a real photo. We know where we’ll be on November 18th! The Buff Men vs. Weak Men live event is sure to bring a big crowd to the Buford Dome. 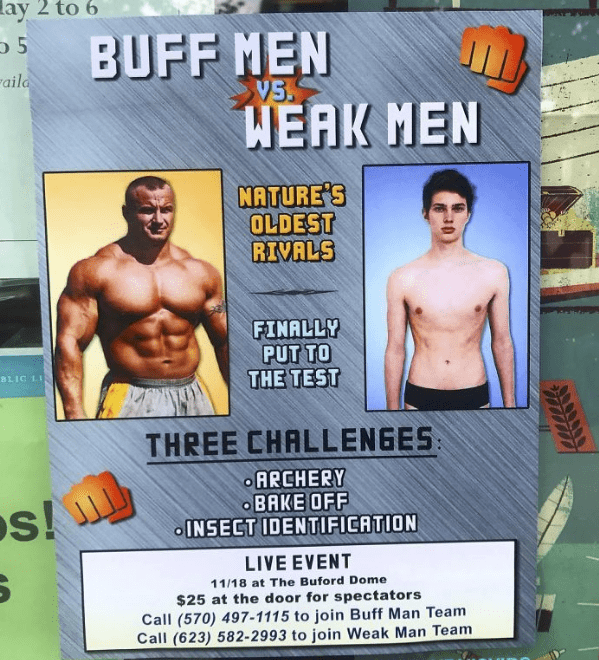 The score will finally be settled between two of nature’s oldest rivals as a team of buff men faces of against a team of weak men in tests of archery, baking, and insect identification. You won’t want to miss this fierce competition, so invite all of your friends. Tickets are only $25 for spectators! The neighborhood Pun-master decided to hang this poster on the bulletin board by the local park. 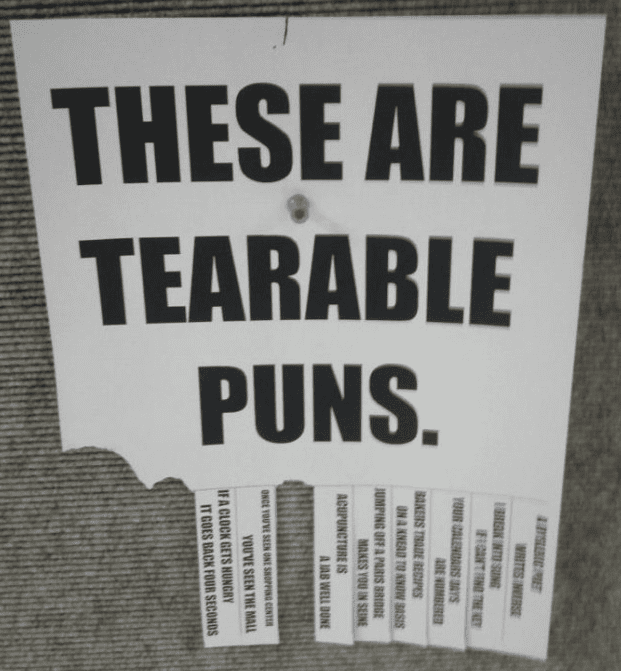 When asked about why he shared his hilarious puntastic pun-poster with the neighborhood, he had this to say: “I’m just trying to brighten everyone’s day a bit. After all, it’s pretty hard to read one of my puns and not, at the very least, crack a smile. I’m just doing my part to bring some laughter into the world.” Job well-done, Pun-master. 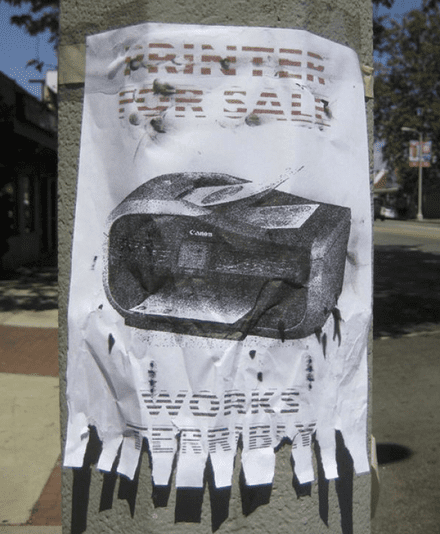 This poster might be challenging to read at first, but once you look closely, you’ll see that someone is trying to sell a printer that “works terribly.” In hindsight, the person trying to sell this printer probably should have used a fully-functional printer to print this poster because this poster is straight-up difficult to read. Additionally, they probably shouldn’t have shared that the printer was not in great shape. We seriously doubt that anyone will express interest in buying this printer. Quitting smoking can be an arduous ordeal, and it certainly doesn’t help when reminders and temptations always surround you. No one understands this more than Mr. Whiskers; the cat featured on this poster. 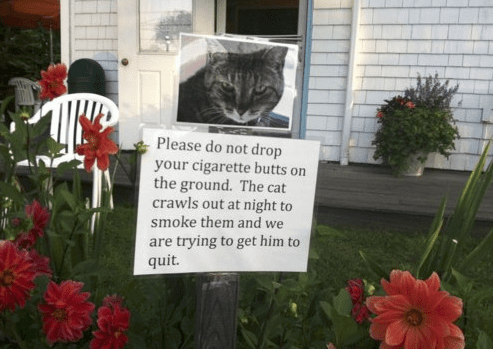 Mr. Whiskers has been trying to quit for a while now, but he keeps falling back into old habits because his neighborhood is often inconsiderate. One day, Mr. Whiskers’ family had enough, so they decided to put up this poster, reminding their neighbors to think about their poor cat. 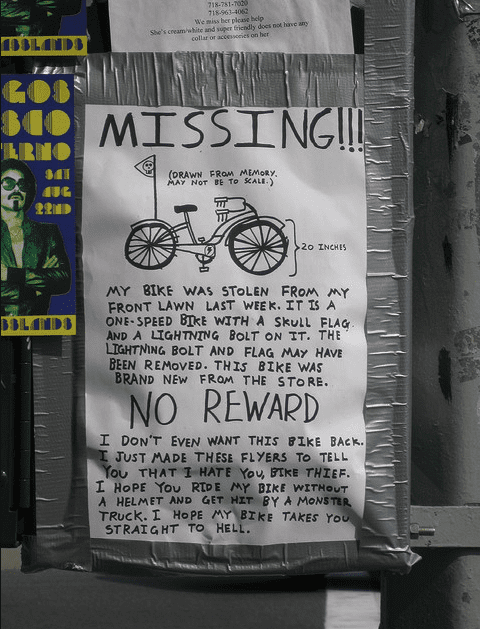 Posters like this one can be a great way of finding a lost bicycle, pet, or even a child who ran away from home. 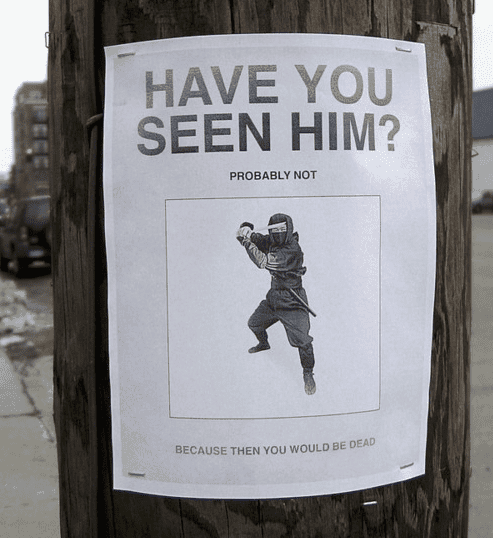 One thing they probably won’t help you track down, however, is a ninja. Ninjas can be deadly, elusive, and crafty. If you ever happen to come across a poster like this, you’re better off just walking away and pretending you never saw anything. The last thing you want is a ninja thinking you’re searching for him. Last year, this couple decided to become teachers and business partners by opening up their very own school. With no former training in education, they needed to come up with classes and lesson plans on topics that they know best. 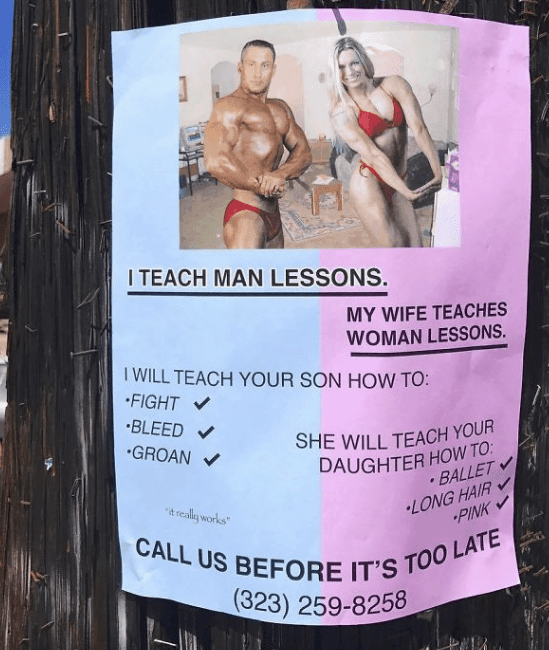 So they decided to start giving lessons on how to be a man, as well as lessons on how to be a woman. While their curriculum may need some improvement, we are happy to report that their business is thriving! 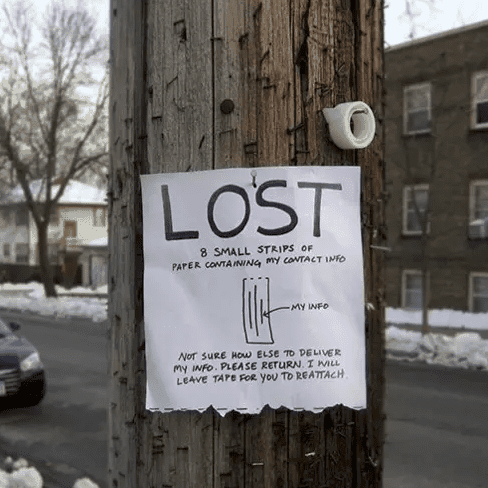 This poster-creator recently lost his smartphone, so the only way he’s been keeping track of his own contact information is through small slips of paper that were attached to the bottom of this poster. Unfortunately, people walking by decided to rip off the pieces of paper, so now this gentlemen is requesting that the thieves who stole his contact information return the small pieces of paper, no questions asked. Otherwise, he’ll have no way of knowing how to get ahold of himself. This witty poster-maker also happens to be a massive fan of the Star Wars film series. It’s apparent from their poster that they’re in search of a couple of droids. But after reading through every small slip of paper, one can only conclude that the droids in this photo are not the droids they were looking for, to begin with. 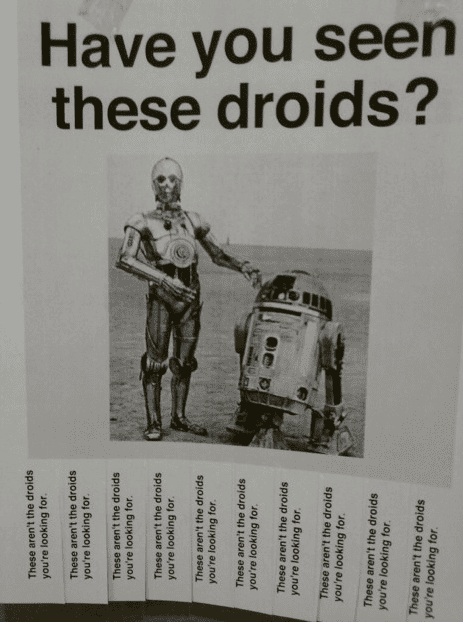 This confusing poster leads us to just one question: Which droids are we supposed to be looking for? It’s pretty rare to find an animal whose appearance matches its name perfectly. 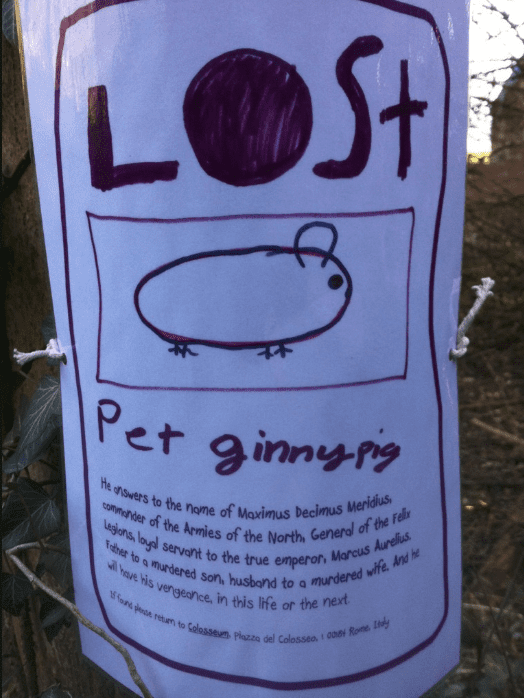 This lost guinea pig, however, might be the rare one percent. When we first glanced at the sketch of the guinea pig, we thought to ourselves, “that guinea pig sure looks like a ‘Maximus Decimus Meridius. '” Lo and behold, it ended up being his actual name! Let’s just hope that Maximus Decimus Meridius is returned home safely, preferably before he has his vengeance, in this life or the next. Sometimes, tough love is the only option for parents. After Ned developed a bizarre habit involving geese, his parents didn’t know what to do. 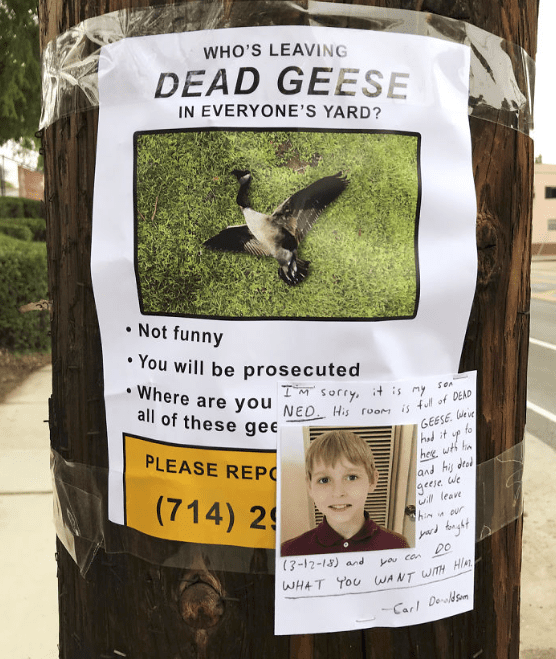 Once they started receiving complaints from the neighbors, they knew there was only one thing left to do, so they left him out in the yard and told the neighbors to “do what you want with him.” We’re happy to report that, ever since Ned’s harsh punishment, no more neighborhood geese have been harmed. Last Tuesday was a big day for Steve. Not only did he reach an impressive milestone, but he also decided to publicly advertise his coming-of-age moment with this classy and sophisticated street poster. 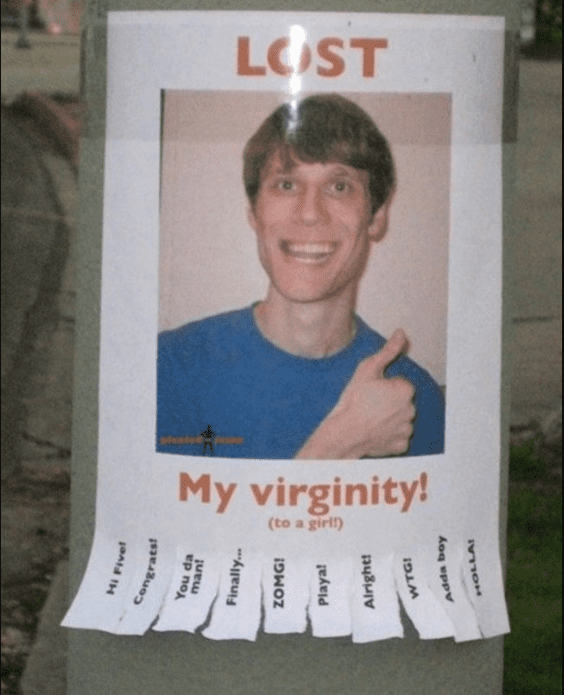 After putting the flyer up in the middle of his university’s quad, Steve received an overwhelming amount of support for his big news. With over 100 new friends on Facebook and a renewed sense of self-confidence, Steve is walking tall as the big man on campus. Love can find you when you least expect it. For the creator of this poster, he discovered love as he was walking down an alley. As he passed by a street post, he noticed that love was simply sitting on the other side, waiting for someone to find it. 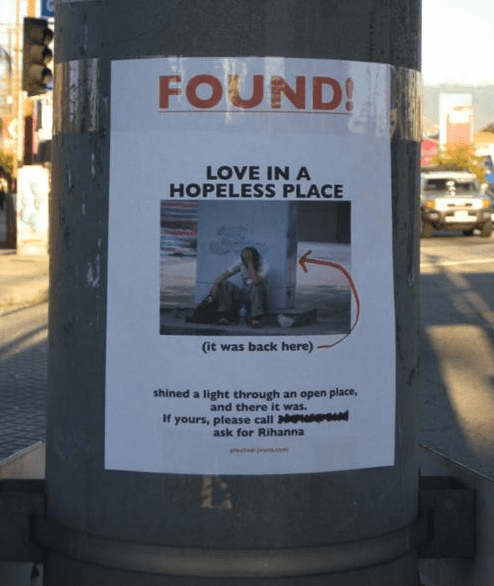 He was so happy about finding love in a seemingly-hopeless place that he decided to make a street poster about his discovery. Either that, or he just wanted to troll Rihanna. 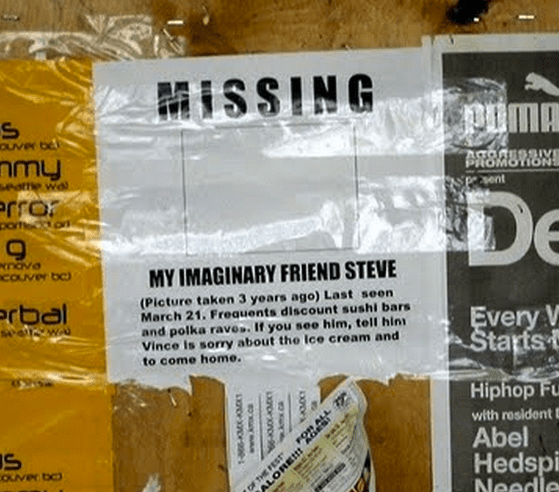 Last March, Vince was enjoying a night out with his imaginary friend Steve. After hitting up their favorite discount sushi spot, the duo headed for the hottest polka rave in town. Then, things took a turn for the worse. Steve decided to surprise his friend with some ice cream. Unfortunately, Vince was still full from the sushi and didn’t want any ice cream, so he threw the cone right at Steve’s invisible face. Steve ran off and Vince hasn’t seen him since. Whether you’ve discovered it yet or not, everyone has at least one special talent. Some of us can solve Rubix cubes at ridiculous speeds; others can juggle chainsaws; some individuals have great singing voices, while others have unbelievable memorizing skills. The man who made this poster is interested in finding one talent in particular. He’s looking for the world’s best Chewbacca impression. To keep the contest as simple as possible, he’s collecting submissions via voice messages and giving the winner 50 dollars. Listen carefully, because time is of the essence. Aaron, a close friend of this poster’s creator, has been missing for over 24 hours. Unfortunately, we don’t have much time. 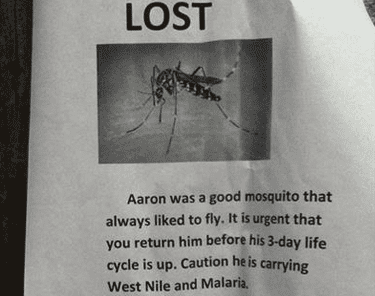 Considering that the average mosquito’s life cycle is only three days long and that it probably took a full day before this poster went up, we estimate that Aaron needs to be found within the next couple of hours. If you see him, please approach with caution, because he may be carrying diseases. Attention drummers! Do you think you’ve got what it takes to play in a totally legitimate progressive rock band? If so, today’s your lucky day. 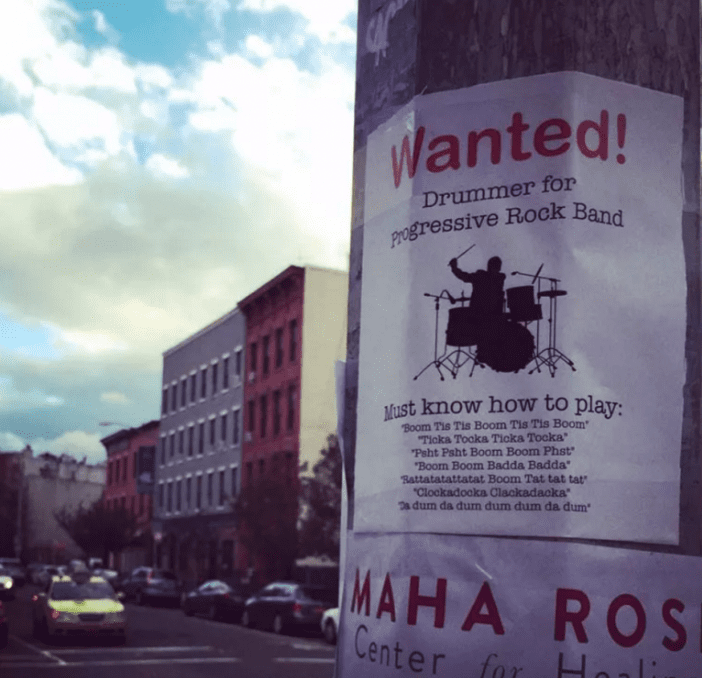 One of the city’s best up-and-coming progressive rock bands is looking to replace their old drummer, who quit the band because his girlfriend told him to do so. If you can play the complex and intricate rhythm written on this flyer, call up the band leader to set up an official audition! 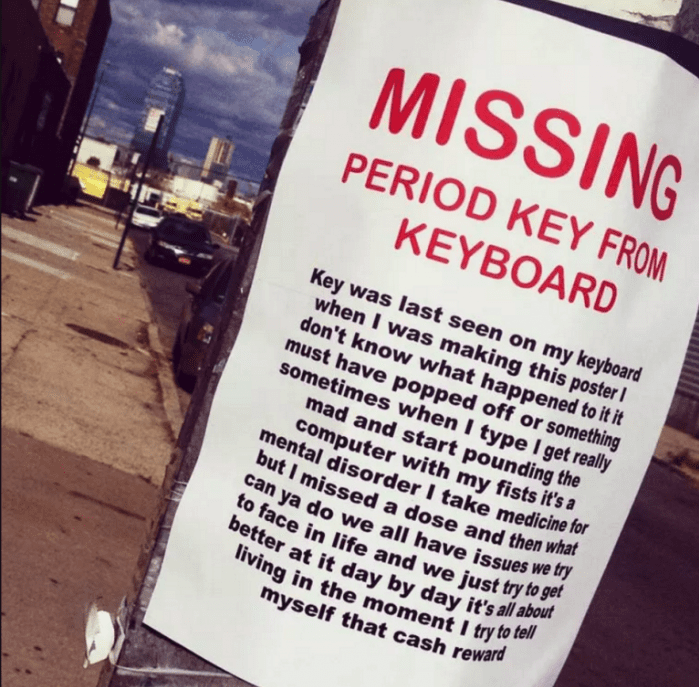 The man who typed up this poster is desperately searching for his keyboard’s period key. Unfortunately, his anger issues often cause him to lash out and physically abuse his own possessions. The latest victim of one of his outbursts was his computer’s keyboard. After his entire project was unintentionally deleted, frustration got the best of him and now his writing is one big run-on sentence. Hopefully he’ll find it soon, because it’s pretty hard to follow his train of thought without proper punctuation. The person who created this poster clearly doesn’t grasp how modern day communication works. 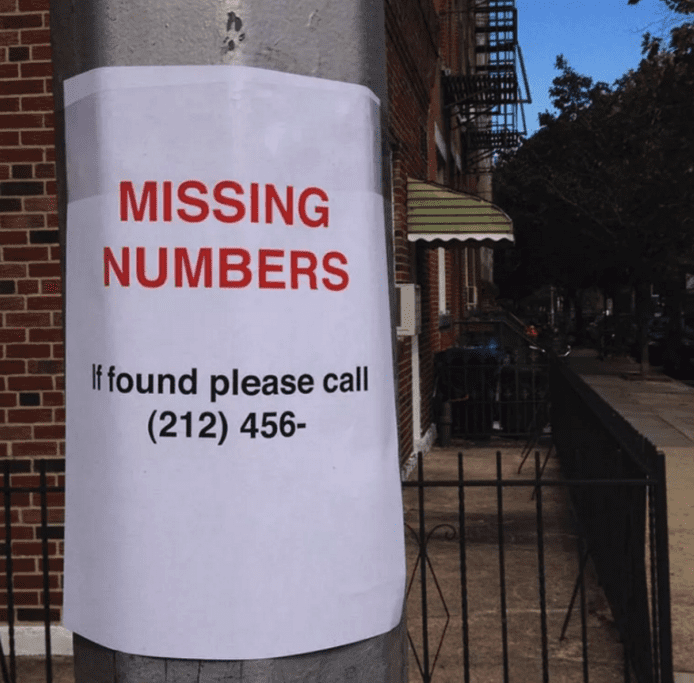 If they had done just a little bit of research, they would have realized that nobody who sees this poster will be able to contact them because the phone number listed is missing four digits. It just doesn’t make sense. Maybe next time they’ll be clever enough to leave an e-mail address instead, or, better yet, use a phone book to find the missing digits. This poster was created by a very short individual. 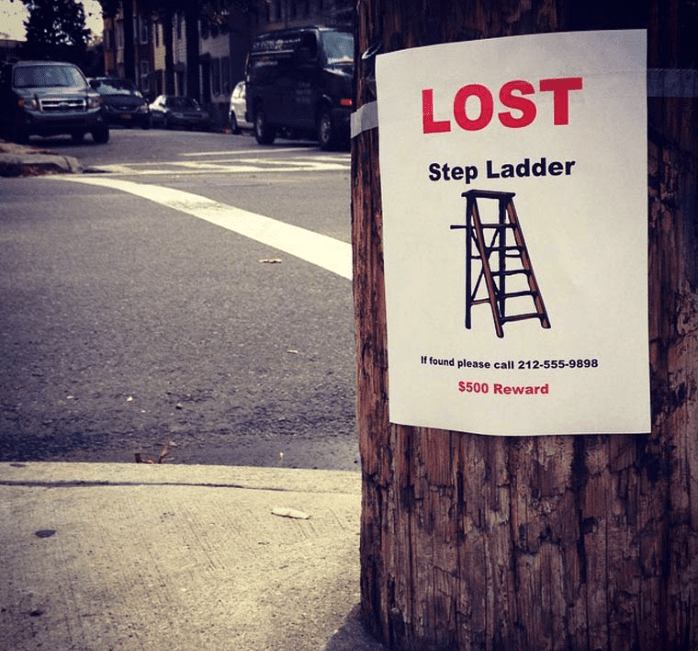 Unfortunately, they made the poster, which advertises a missing step ladder, before realizing that, without the step ladder, they’de have no way of placing the poster on the street post at a height where a majority of the population would be able to read it. We also couldn’t help but notice that they posted a $500 reward for whoever returns the missing ladder. Wouldn’t it make more sense just to buy a new step ladder? It’s a bit difficult for us to make out exactly what this poster is advertising, probably because half of the poster was ripped off. 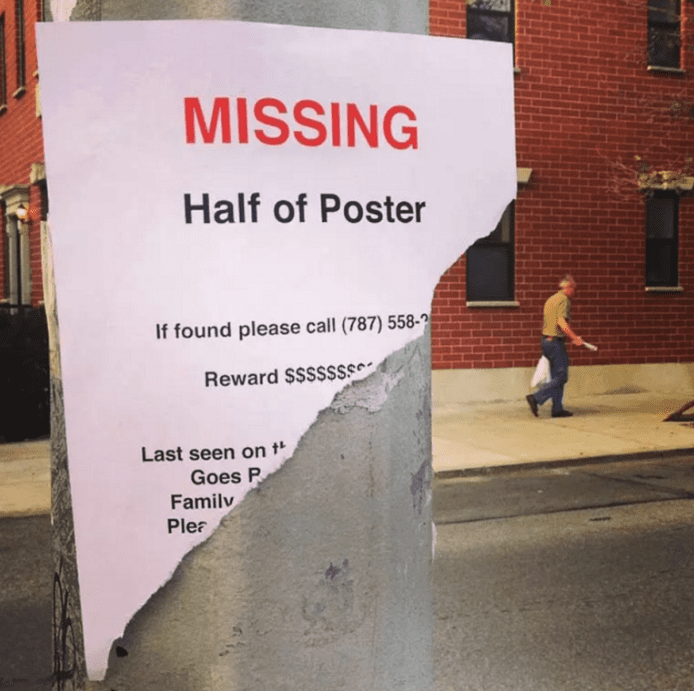 After a thorough analysis, we were able to gather that whoever made this poster is searching for the other half. 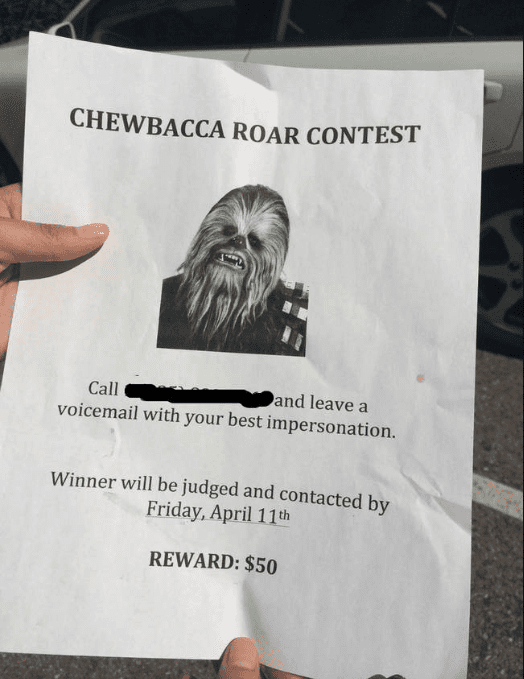 Unfortunately, we were unable to decipher what phone number to call, how much money the reward will be, what the other half of the poster looks like, or any other piece of information that is probably critical to the search effort. 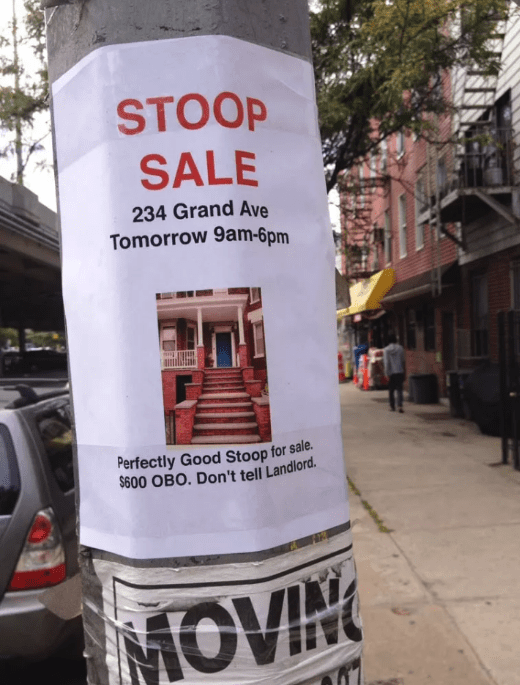 This poster would be a little bit more believable if it had said: “stoop for rent.” But, because it reads out: “perfectly good stoop for sale,” we can’t help but be just a bit skeptical. First of all, it just seems impractical, not to mention impossible, to sell someone an entire stoop. It’s not like you could just load it into the back of a moving truck and bring it home. Secondly, the whole business of not telling the landlord seems quite sketchy. 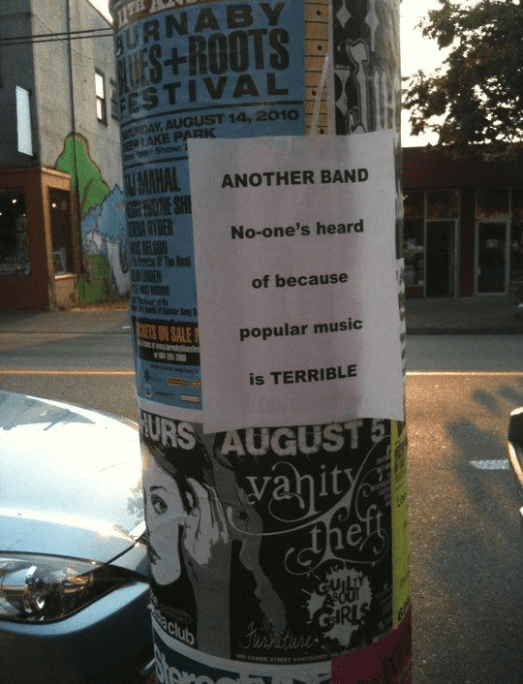 When the local hipsters heard that Katy Perry was coming to town, they decided that enough was enough and that they needed to protest the popular music that’s been taking over television and radio for the past ten years. Their first move was to hang these posters all over town and any place where flyers advertising concerts were. So far, that’s all they’ve managed to do. As far as we know, Katy Perry is still coming to town. We’ve got some good news for anyone with relevant experience looking for a job. 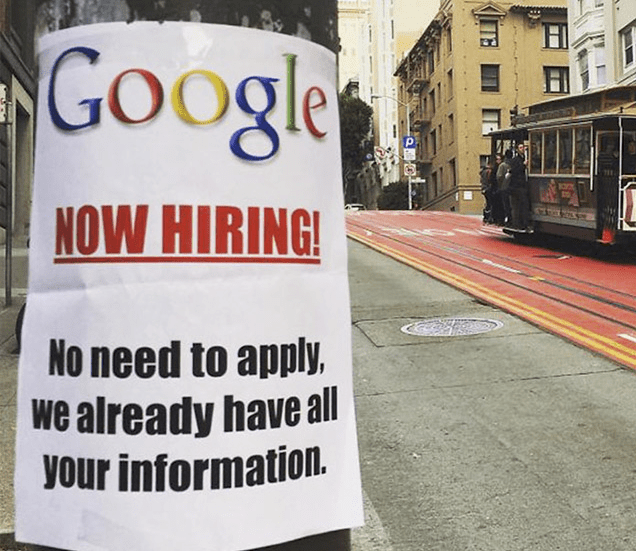 Google is hiring! The best part of this sweet deal is that applicants don’t even need to send in an application or resume anymore. It’s all part of Google’s latest system which involves collecting personal information over the course of several years of everyone who has ever used the internet. Because Google already has access to your personal information, all you need to do is wait to hear back from them! We’ve all had those nights. After one too many beverages, you wake up confused and with a massive hole in your wallet or bank account because you impulsively bought something that you don’t really need. The gentleman who made this poster woke up holding a rubber fist that he purchased the night before for no apparent reason. 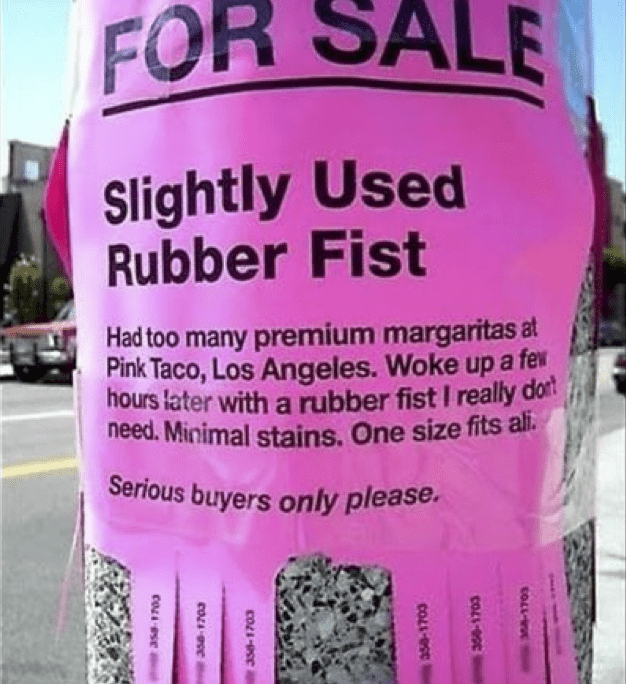 Now he’s doing everything he can to sell the rubber fist and forget that he ever made that purchase in the first place. Breakups can be painful. After Frank had his heart broken by his girlfriend of six years, he decided to cope with the heartache uniquely. Rather than lie on his couch all day crying and eating Ben and Jerry’s, Frank chose to build a boat. The only problem was that Frank had no friends because he had been in a six-year relationship. 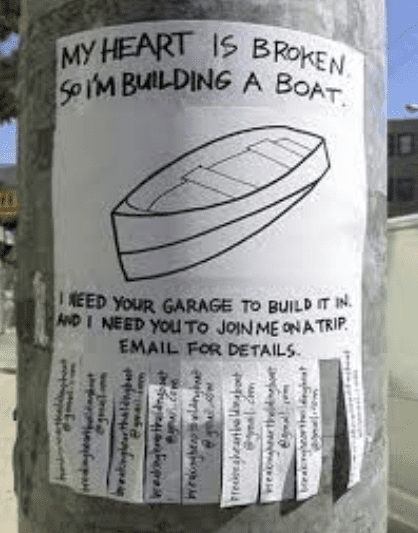 So he made this poster, hoping to find a buddy who could help him build a boat and travel across the ocean. 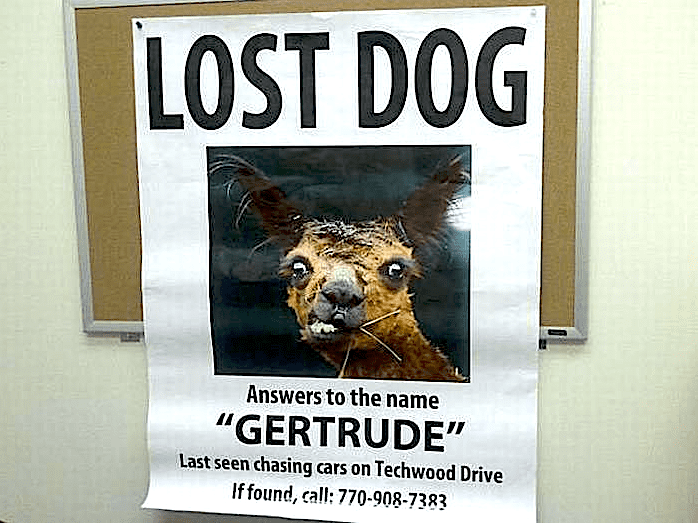 While we’re pretty sure that dogs are in no way related to alpacas, this person is clearly desperate to find their missing Gertrude. We just don’t know if it’s a good idea to call only to tell them that Gertrude isn’t really a dog? But then again, why go and burst someone else’s bubble when they’re obviously desperate to find their missing pet? Though, we’re pretty sure that any motorists being chased down by an alpaca would certainly have let the authorities know – so best to start with the police! Unicorns are fantastic beasts from mythology that are incredibly rare to find in real life, are said to have magical powers, and have been featured in a number of legends over the course of history. So you can only imagine how happy this owner was to have one. 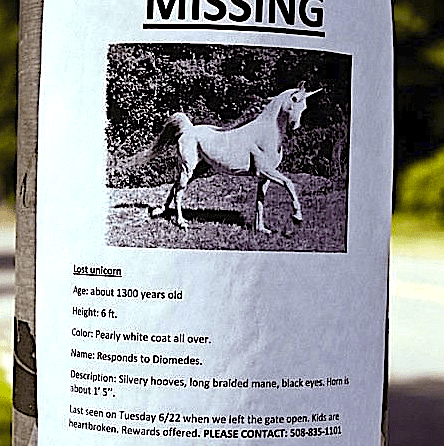 Then again, losing a unicorn must be a traumatic experience indeed – so we can only hope and pray that young Diomedes was found and returned to his rightful owner. 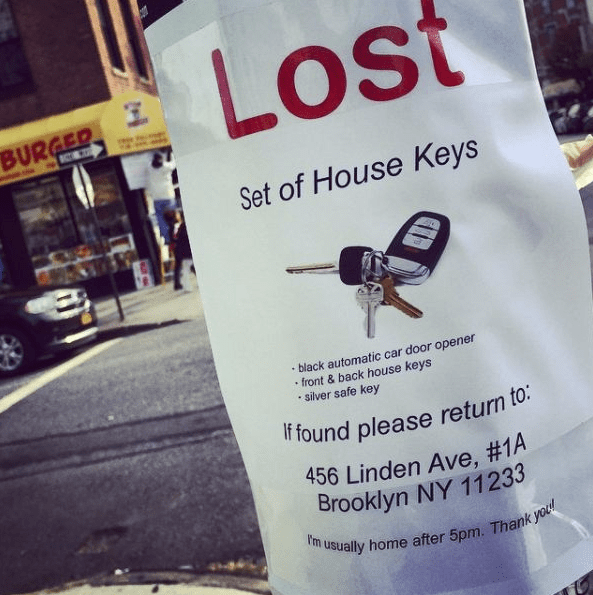 Although we assume that the search party will be busy for a long, long time! Um, dog? This poster definitely had us looking twice. 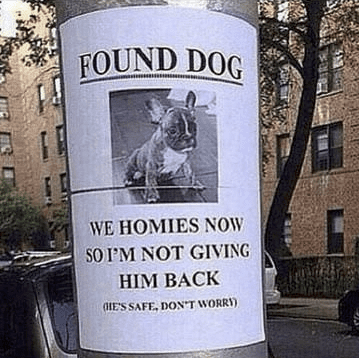 Not only did this person openly just declare that even if they had found a dog, they’re not planning on returning it anytime soon – but it’s not even a dog! We suppose some bonds are just so strong, that the idea of breaking them is unthinkable for some – especially that of a man and his dog. We can only imagine how sad the original owner must have been when they saw this! Okay, so we have literally never seen anything like this before. We couldn’t even really tell if this dog was alive or dead, but it looks utterly terrifying! It’s like something out of an old horror movie. Stumbling upon this thing in a dark alleyway would definitely have you running in the opposite direction as fast as your legs could carry you! 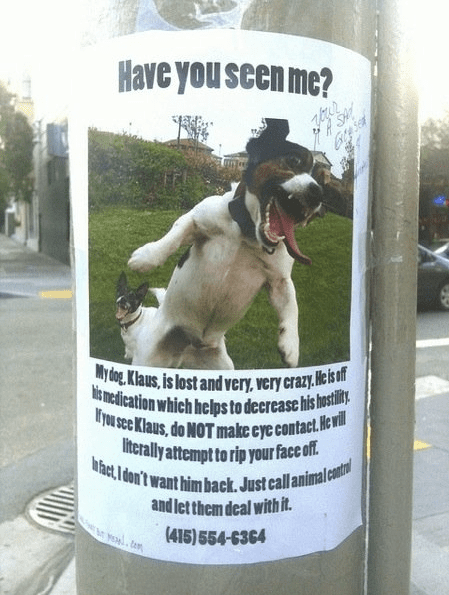 The caption really helps to sell this joke as it flips the conventional ‘missing dog’ poster format on it’s head, making it more of a warning than anything else! Every pet owner believes that their pet is the best in the world – that theirs has the perfect coat, the perfect sheen, the perfect attitude, and the best character out there. But when it comes to missing alpacas, we certainly have to agree that Dexter definitely ranks highly on the ‘best sense of character’ list! Those teeth and that hair? 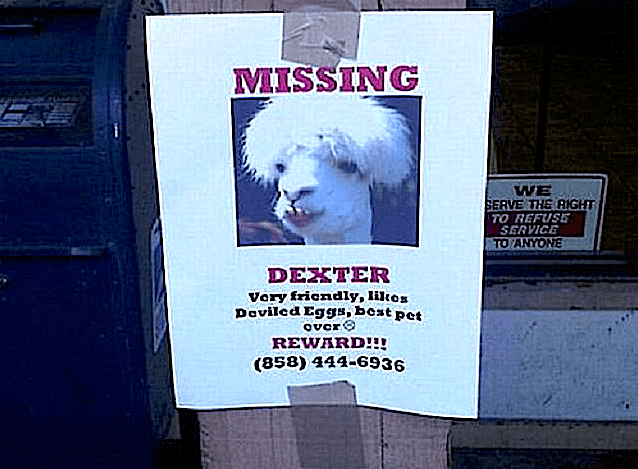 Wow – Dexter could have been a model if he really wanted to! He clearly also enjoys the high life, as deviled eggs are quite the luxury for an alpaca! Okay, so this one is obviously a joke that’s been taken a little too far! Seriously, if you’re going to keep a fly for a pet, the least you can do is invest a little fly leash or a collar, that’s what a rational pet owner would do, right? 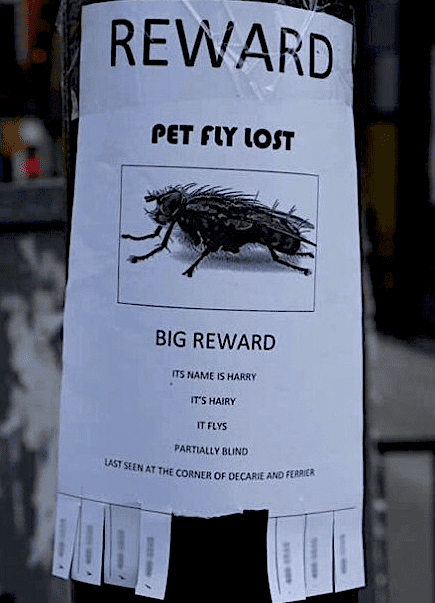 So while the description is incredibly helpful and the picture highly detailed, unfortunately, we don’t think they’ll be finding this fly any time soon. Harry the fly is most likely enjoying his freedom around a nice, warm dumpster right about now. We’re pretty sure that you’d need a really specialized license to own a pet like this. In fact, we’re surprised that the military hasn’t already been called in! To be honest though, spotting something as big as a Godzilla-type lizard creature with inter-dimensional powers and glowing, blood red eyes shouldn’t be that difficult. Just follow the trail of destruction it leaves in its wake! We can’t really tell if the owner thinks anyone would be brave enough to catch this or not. Maybe it’s a challenge? 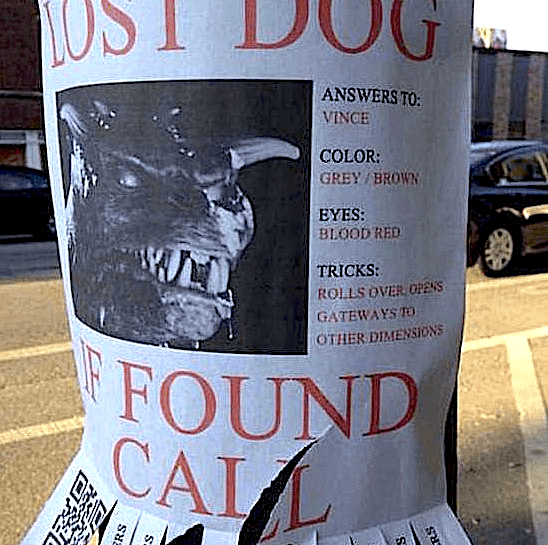 Having a cat go missing can be a real hassle. Sometimes you’re lucky enough to have them return home, which is something that cats are known for doing. However, if your cat was last seen with Alf, there’s a good chance he’s most likely been eaten. While Alf is an otherwise harmless creature when it comes to humans, the truth is that cats are like a delicacy for him. 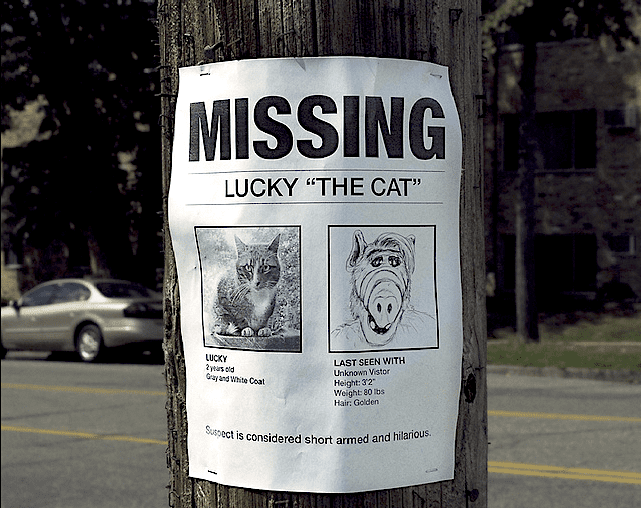 So, unfortunately, we think there’s a good chance that Lucky the cat was a little unlucky this time around! The man who made this poster will surely learn his lesson the hard way. Seriously, why would he think it’s a good idea to post not only his exact address but also that his house is empty until 5 pm every day? It’s like he’s asking for a burglar to come and break into his home and steal all of his valuable possessions. We’re really hoping that he takes this poster down and changes all of the locks at his house. Each year, millions of Americans tune in for the SuperBowl, the ultimate gridiron test to find out which NFL team is the best. While the SuperBowl is one of the most widely-watched television broadcasts in the US, not everyone is interested in the game. Some people prefer to watch the Puppy Bowl, which airs on Animal Planet during the SuperBowl. 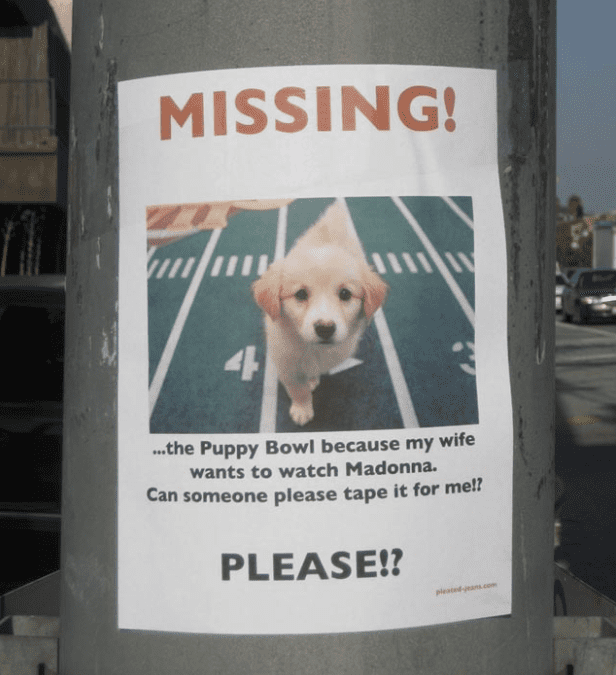 This poster creator found himself in an unfortunate situation after his wife wouldn’t let him catch all of the Puppy Bowl action. While this poster may be true, it’s also extremely cruel and heartless. 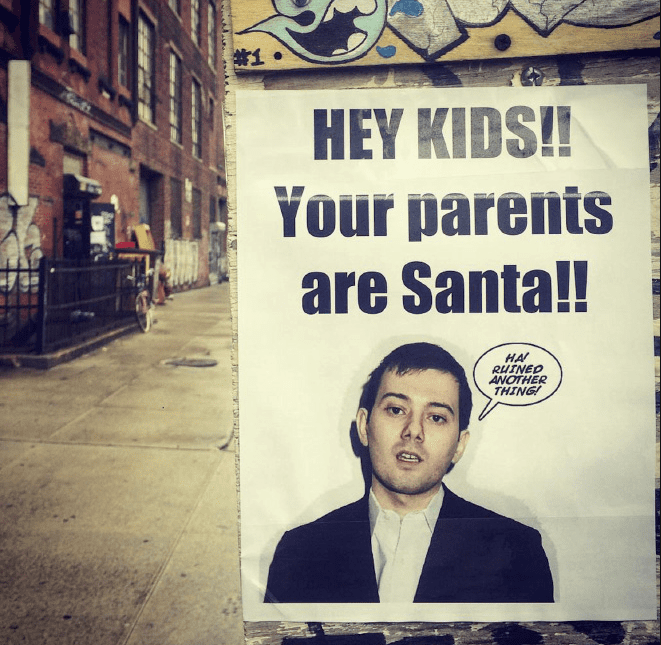 Why would anyone want to ruin Christmas for children by putting up a sign in the middle of a sidewalk telling kids that Santa Claus is actually their parents? Even though children are bound to find out eventually, it should be when their parents are ready to tell them. This fellow must have gotten his inspiration from the classic Christman film, How the Grinch Stole Christmas. They say hindsight is always 20/20. This poster is a testament to that phrase. Surely, it would have come in handy if it was put up 24 hours ago. But now, it only serves as a reminder to the driver of the red sedan that was parked in front of the tree during yesterday’s soccer tournament that he needs to pay the ticket before it’s overdue. 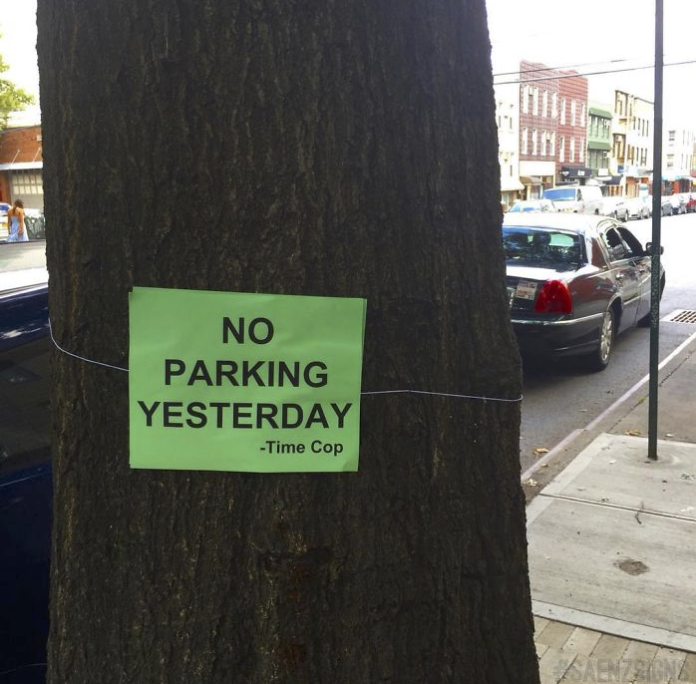 Hopefully, Time Cop will be better about putting his notices up on time from now on. London Brown, a Jack Russell Terrier, ran away from home two days ago and his owners have been worried sick ever since. London has white fur, and is very friendly, as long as you calmly approach him and maybe even offer a treat. 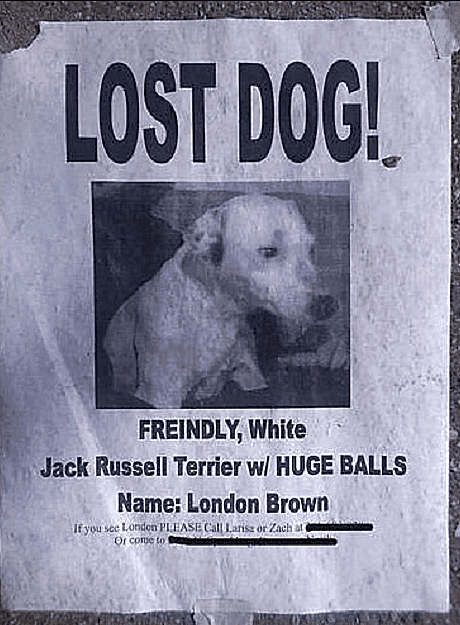 The lost dog was last seen holding two very large tennis balls in his mouth. His owners say that they are his favorite balls, so don’t try to touch them or he might get feisty. It’s a good thing nobody from Middle Earth saw this poster. Otherwise, the Lord of the Rings trilogy could have had a much different ending. If Gandalf were ever to see this poster he’d probably regret bestowing such an immense responsibility on such an irresponsible hobbit. 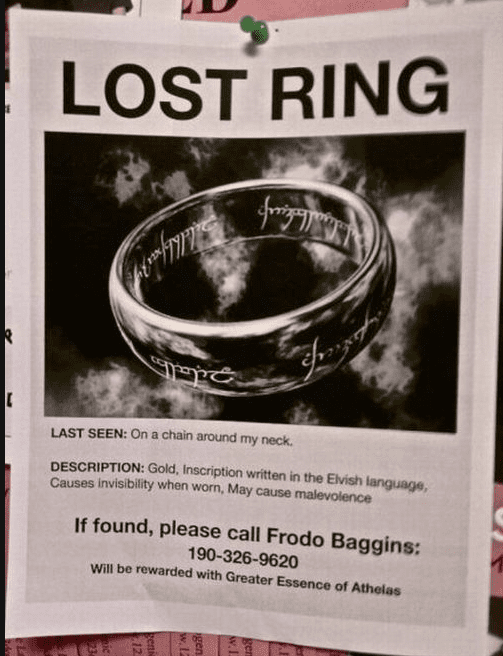 You would think that after everything he went through, Frodo Baggins would have found a smarter way to advertise his lost ring. But nope, it turns out that some hobbits just never learn.